21-27 May is National Vegetarian Week here in the UK, and Vegetables, Beautiful Vegetables is an event to encourage food bloggers to share their favourite vegetarian recipe. As I have a teenager who is a vegetarian and a non-meat eating husband, most of our meals revolve around veggies. It's too hard to pick a favourite recipe, there are so many, but in order to use the last leek from our garden, I chose spring rolls. Spring rolls are easy to make and you can use any vegetables that you fancy - just make sure they are all cut to the same size, stir-frying the ones that need cooking longest first, followed by the rest. Vegetables of your choice, be creative! Cut all the vegetables into thin strips and heat the oil in a wok or large frying pan. Stir-fry the onion for a minute, then add the carrot - stir-fry, then the leek, followed by the red pepper, chilli, garlic and finally the bean sprouts. Season and add the rice wine and soy sauce, cook for another minute and pour into a dish to cool. 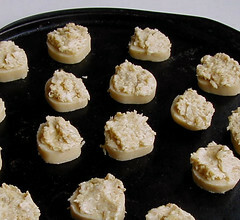 Place a tablespoon of filling (drained from sauce) into a corner of the wrapper and roll, folding the ends in as you go. 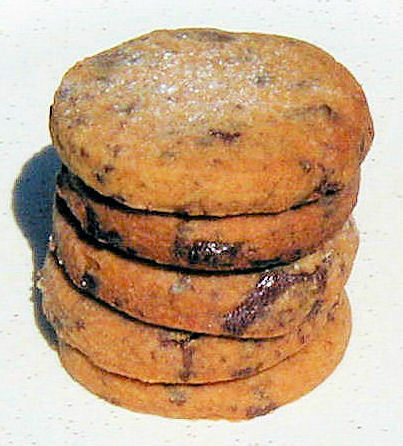 Depending on the size of the wrappers - you may need more filling if they are large ones. 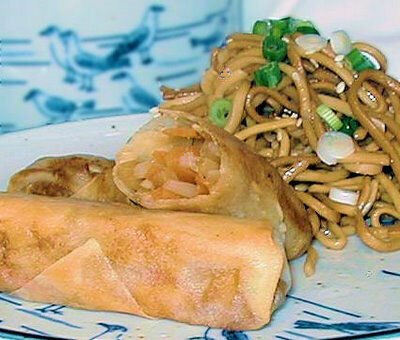 In a large frying pan, fry the spring rolls in a single layer until golden brown and cooked through, about 4 minutes. Adjust the heat as necessary. Remove with a slotted spoon and drain on kitchen paper. Serve them at once, hot and crispy, with a dipping sauce. When my husband comes back from the corner shop on Saturday mornings laden with the newspapers, the first thing I do is rip the plastic bag off the The Guardian Weekend magazine and thumb through to the food section to see what glorious recipe Dan Lepard has come up with. Dan is an artisan baker with an excellent website, which I have just discovered - it has a forum where you can find out everything you ever wanted to know about handmade breads, bread techniques and ingredients, and if you have a problem - this is the place to ask. This recipe from the April 22 2006 issue of The Guardian Weekend is a winner. It is an unusual mix, the base is a crisp shortbread round and the topping has a contrasting chewy, soft texture - made from a mixture of cream, oats and lemon curd. 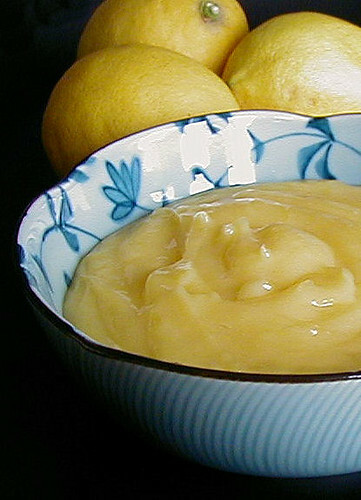 Make sure you use a really good lemony lemon curd - I made my own - see Lemon Curd. I could eat a bowl of just the oat/lemon topping it’s so good! 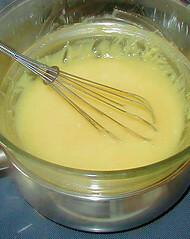 Measure the oats, cream and lemon curd into a small bowl and mix until combined. 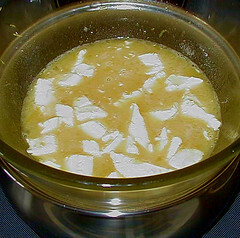 Cover the bowl with clingfilm until ready to use. Mix the sugar and butter with the lemon zest for a couple of minutes until fluffy, then add the flour and ground rice, mix until you have a soft dough. Roll into a cylinder about 5cm by 20cm long and wrap in cling film. Chill for at least an hour until firm. 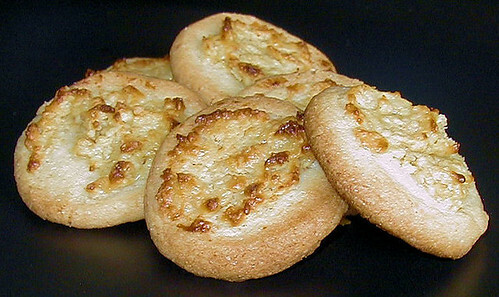 Heat the oven to 180C/350F/Gas 4-5, line a large baking sheet with baking parchment and slice the dough into 1½cm discs. They may crumble as you cut them but you can just press the dough back together again. Space them well apart as they will spread a bit. Spoon a teaspoon of the oaty/lemon mixture on each circle of dough and spread it to the edges. 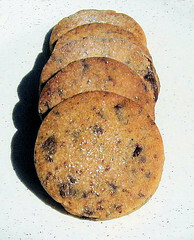 Bake for 20-30 minutes or until the cookies have just risen and the tops are browning. Cool for a few minutes until placing on a wire rack to go cold. 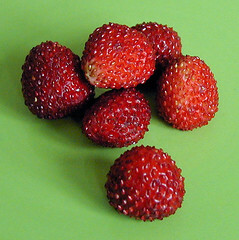 We have something wonderful in our garden - a patch of wild strawberries close to our garden pond. The patch seems to get a little bigger each year and last year produced a couple of handfuls of sweet, delicious berries. 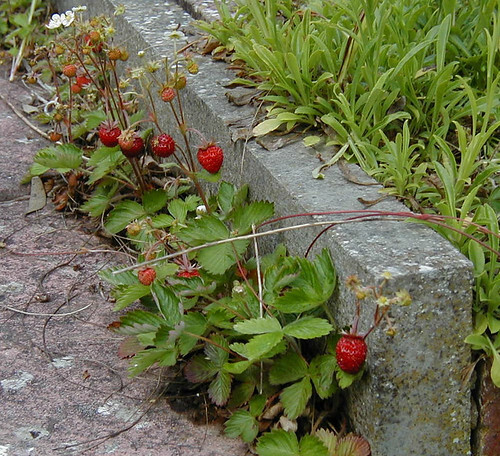 Today was damp and cold, but in that little spot by the steps where the plants have seeded themselves, there were glistening ruby jewels dancing in the breeze. LIVESTRONG Day is the Lance Armstrong Foundation's (LAF) grassroots advocacy initiative to unify people affected by cancer and to raise awareness about cancer survivorship issues on a national level and in local communities across the country. Although I am too late to participate in the food blog event 'A Taste of Yellow', I still wanted to make something to highlight LIVESTRONG Day which will occur on Wednesday 16 May 2007. So I made lemon curd in memory of my father - who's birthday it would have been today. I used a Delia Smith recipe which you will find here, I only made half the amount which will be enough for some lemon curd cookies I have my eye on. I never liked coffee until later in my life when I realised that it didn’t just come in a dark, thick stream. When I was young, my father and I would go into town and he would take that little diversion just to go past the coffee shop, the smell following us right up the high street, me burying my nose in my jacket. These days, I still don’t drink much coffee but have found other ways to enjoy it and coffee and chocolate is the perfect combination of flavours. I recently bought Baking: From My Home to Yours by Dorie Greenspan and this is one of the recipes that caught my eye. Espresso-Chocolate Shortbread Cookies, extremely crisp - a great twist on the traditional shortbread and perfect for, dare I say it, accompanying your morning coffee! Dissolve the espresso powder in the boiling water and set aside to cool. Beat butter and sugar together on medium speed for about 3 minutes until smooth. I used a hand held mixer. Beat in the vanilla and espresso and reduce mixer to low speed, add the flour until it just disappears into the dough - don’t work too much. Fold in chocolate with a sturdy rubber spatula. I differed from the recipe at this point and gently rolled the dough out to about a ¼ inch thick and cut out rounds with a biscuit cutter, then put them on unbuttered baking sheets, prick a couple of times with a fork and put them in the fridge for a couple of hours. Heat oven to 325ºF and bake for 15-20 minutes. I think mine took slightly less time to cook, you want them just lightly coloured. Cool on rack and dust with icing sugar while hot. Apparently I got ‘tagged’. I have to make a list of 7 things about me - which is the easy part - then ‘tag’ 7 other bloggers. I am going to pass on the tagging bit - mainly because I don’t know any other bloggers to tag. Hey - I only just started this blog a couple of weeks ago, but I’ll do the list and hope I’m forgiven by Marie at Marie’s Muses. I hate eggs - boiled, fried, omelettes - you name it! The nearest 'eggy' thing I might manage would be a quiche. I stepped on a scorpion once and didn’t get stung. I don't like windy days. I just discovered how delicious butternut squash is. I have bread baking in the oven right now! I wear my Grandmother’s engagement ring. I can't whistle but wish I could! 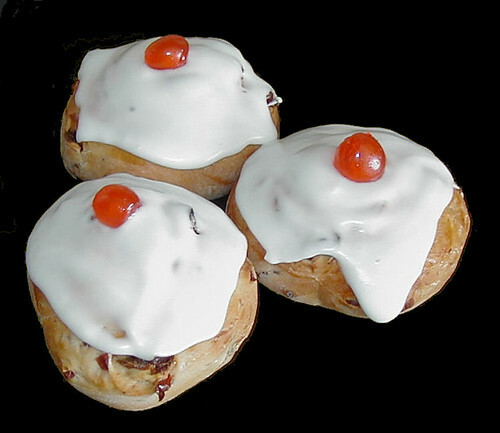 This is my own take on the Belgian Buns that you can buy in any bakery over here. Sometimes I ice them and add that familiar cherry on the top, but mainly leave them plain, split and spread with unsalted butter - delicious! 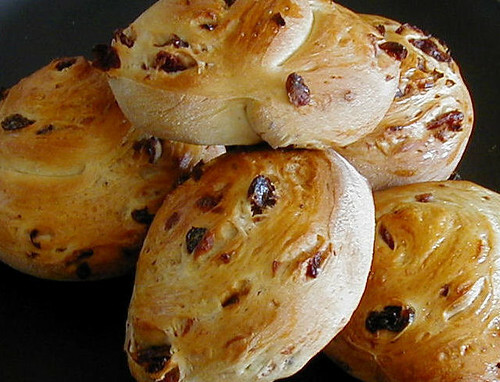 I recently found packets of dried fruits that were sublime, and used these instead of ordinary raisins, making the buns a little bit special, Berries and Cherries. Call me a cheat if you want, but I make these in the bread machine - they come out light and soft every time. Put all ingredients into your bread machine in correct order, except dried fruit. When it comes to the egg and water, I weigh the egg and then add the water to come roughly to 360-370ml in total. 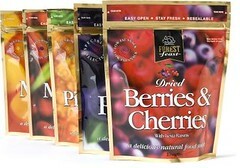 Put the dried fruit into the dispenser, or add according to your bread maker instructions. When dough is ready, roll into an oblong roughly 16” x 10” and roll up as if rolling a swiss roll. 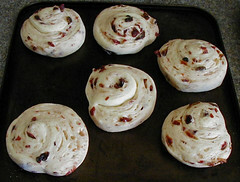 Use a sharp knife and slice pieces of dough off about 1½” thick, about 10 buns. 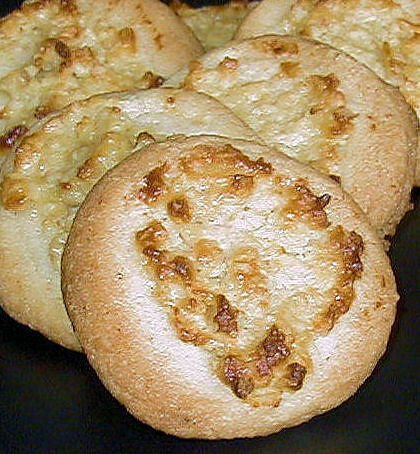 Put them on a baking tray and flatten them a bit with your hand. Cover and let rise until doubled in size, brush with beaten egg and bake in a pre-heated oven 350ºF for about 14 minutes. Cool and ice if wanted. Just add a little water at a time to a couple of cups of icing sugar until you have a stiff but spreadable consistency, top with a glacé cherry.